The demand for lighter and stronger products drives the recreational and outdoor industries. i3D MFG’s direct metal laser sintering using copper, aluminum, titanium, Inconel, stainless steel, and maraging steel brings solid and reliable parts to manufacturers of extreme sports equipment. 3D printing using DMLS allows for cost-effective production using exotic metals, flexibility with research and development, one-off customization, and speed-to-market efficiency. i3D™ specializes in direct metal laser sintering and melting services in titanium. We reduce the material waste by around 70% using additive manufacturing. Instead of manufacturing parts out of billet, additive manufacturing builds parts by fusing micro-layers of metal power together using 400W lasers on 20 to 40 micro-layers of metal powder. Due to the efficient use of material in 3D printing, this process is more cost effective than traditional machining or casting. The value for custom bike manufacturers is increased due to our ability to customize designs as well as manufacture in small batches without the need for tooling and set-up costs. Protecting customer designs and costly tool change time is done with the ease of on-shore services. i3D™ can take new ideas and reworks on current gear to full production in weeks through our 3D manufacturing process. Compared to traditional manufacturing methods, titanium, Inconel, and stainless steel are more effective by around 30% through the Direct Metal Laser Sintering services. This process also reduces the scrap materials by around 60%. Single parts, eliminating welds, gaskets, and screw can be printed from complex 3D geometries and assemblies. Because of this, the part efficiency is increased, and the potential failure points are reduced. New innovations can be easily achieved through incorporating conformal channels, lattice designs, and inserts into a 3D design. 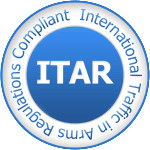 As an ITAR company, we are certified for military and local public safety contracting. Traditional machine scrap is reduced by 50-70% through our DMLS/DMLM process. Like traditional cast and machined parts, our titanium parts can be processed the same way due to the high-density percentage. Increased part and labor efficiency is achieved through the complex 3D geometries and assemblies being able to be printed as single parts, eliminating welds, gaskets, and screws. We offer one of the largest selections of DMLS/DMLM standard metal powders in the U.S. and are one of the few 3D manufacturers specializing in Titanium. Partnering with the EOS North American Material Process Application, we specialize in custom metal powder applications. Our company has significant competitive advantages in design and proprietary advancement due to the knowledge on Design-for-3-D strategies that our expert engineers possess. Our most common DMLS/DMLM Aluminum powder is AlSi10. Ideal for thermal, low-weight projects, thin walls, and complex geometries, AlSi10 is the perfect choice. If corrosion resistance, strength, weight reduction, and biocompatibility are required for a project, Titanium (Ti64) is a well matched DMLS/DMLM powder, making it ideal for medical device, aerospace, defense, firearms, energy, and automotive projects. DMLM/DMLS Stainless steel is a medical-grade, serializable, corrosion-resistant steel. Stainless Steel hardens to 40-45 HRC after heat treatment. Our stainless-steel equivalents include 15-5, 17-4, and .316. Machining, spark-eroding, welding, micro shot-peening, polishing, and coating can be done to any part made from DMLM metal. Commonly used for tooling applications, Maraging (tool) Steel (MS1) is a pre-alloyed, ultra-high strength steel powder that has mechanical properties. The chemical composition of MS1 is comparable to U.S. 18% Ni Maraging 300, European 1.2709 and German X3NiCoMoTi 18-9-5. MS1 has around a 50-53 HRC after heat treatment. The DMLS nickel, IN718/INC 625, are Chromium alloys with superior heat resistance. After heat treatment, IN718 has around 40-47 HRC. Inconel is used and relied on by rocket, space, aerospace, firearms, energy, and automotive industries. We are proud to be the market leader in DMLS/DMLM powder development. i3D™ is the first North American EOS Material Process Application (MPA) Development Partner in addition to our established metallurgical partnerships. Because of these partnerships, we have access to the latest DMLS machine parameter sets. This enables us to develop highly specialized powder applications for aerospace, rocket, defense, firearms, medical device, oil & gas, energy, automotive, and casting customers.